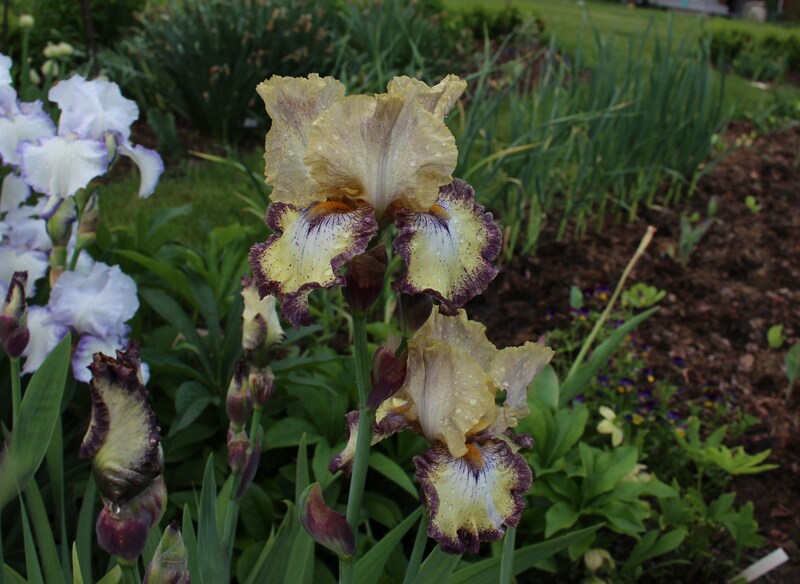 This entry was posted in iris, late spring, perennials and tagged bearded iris, historic iris, iris in the garden, spring. I so agree, let’s leave Sunday for just enjoying our gardens! I think the family of Iris is a fantastic family, an iris for every situation, in the shade, in a bog, in the sun and they come in all shapes, sizes and colours! Which other plant does all that? 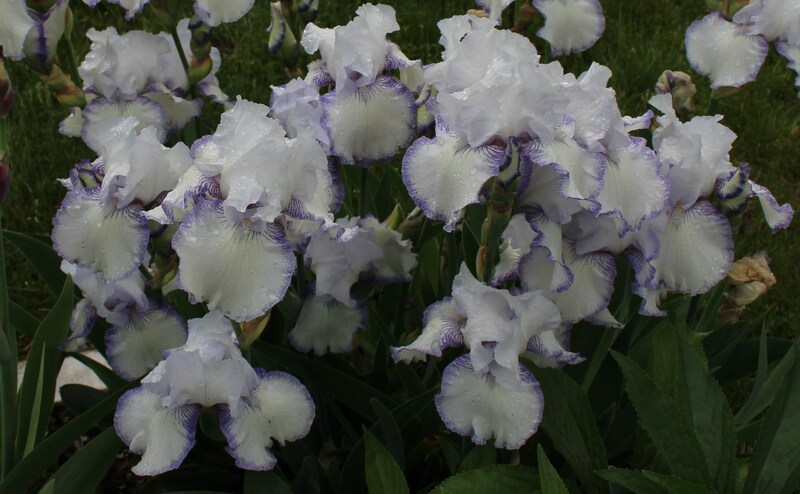 I think of all your iris I like the Siberian Iris in your first photo and the Iris Snowbrook, I think the petals are so beautiful edged with blue, subtle and classy! Snowbrook is very nice. Maybe I just need to divide it to open up the clump a little. You do have some gorgeous Irises. There are so many hundreds of amazing irises that it is a hopeless ambition to try and acquire all of them – just as well really. They have finished here so I have gone on to fretting that I can’ t fit in any more roses. And there are so many hundreds more that I really need. Iris are so easy to fit in here and there, roses seem to require so much more thought and responsibility! I saw some of the goodies you have there and don’t blame you for wanting to add a couple dozen more! I’m not as desperate an iris collector anymore compared to other plants. With iris I’m fine passing them on and moving on to new varieties…. Like you said there are so many and I only have so much space. I too have many iris , but I always combine them rather than dedicate a bed. Their leaves are fine, but not when they go brown. They are partnered with Asiatic/Oriental lilies which bloom right after them and the iris leaves help support the lilies. The make a nice pair. I don’t think I would like the grass in that bed either. Sunday for enjoying??? Never happens here. 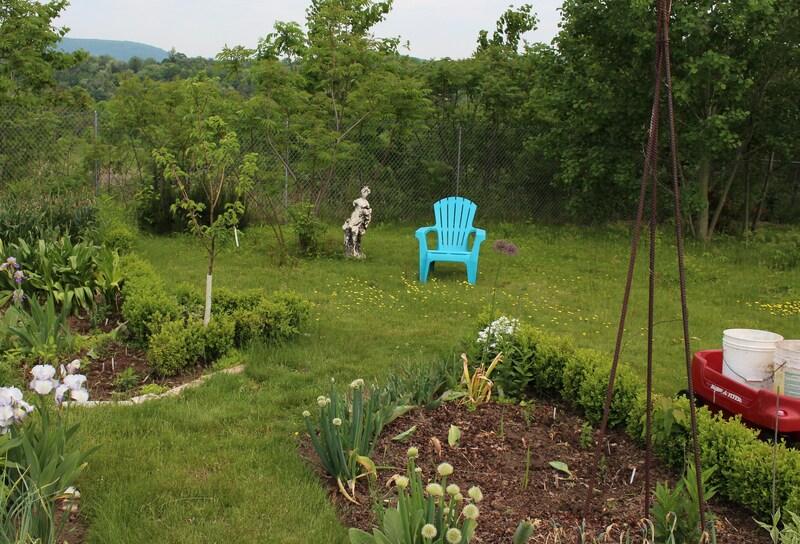 All day in the garden today – only because all week I am the gardens of others. I’m setting up the back porch, it always turns into an all day project especially when I decide to refinish table tops and clean cushions! I’ve seen your iris plantings, however you grow them they really seem to like it! Hmmmm. I wonder how many lilies I could fit between the iris clumps? Try it. They don’t take anything from each other, like good friends! Your unknown iris in the tomatoes looks familiar. It’s not in my garden, however. Can’t say if I saw it in a catalog or in a friend’s garden. You might ask the kind folks at Old House Gardens for i.d. help. That’s a good idea, I’ve seen photos of this iris (or something very similar) on the historical iris preservation society’s website. The comments usually are it’s common, it’s nice, and no one seems to know its name! I rescued a tiny clump of irises from a Bad Spot in the yard a couple of years ago, and am currently being rewarded for the effort with that classic old-iris scent and lovely blooms…makes me want MORE! but not all of the newer ones have that classic scent, the fragrant ones are still the best! Your irises are great. 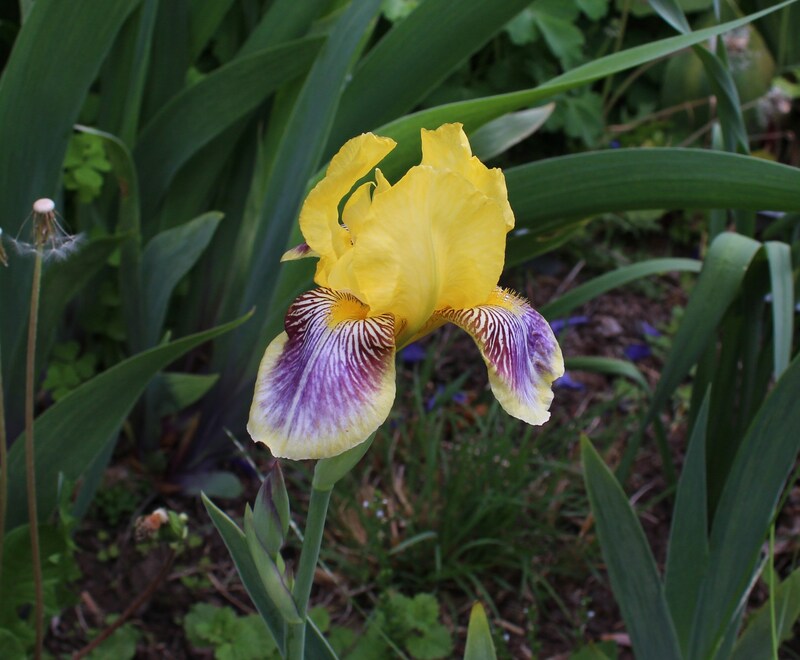 Really like the Siberian iris–such nice color. I think sitting in the garden contemplating is important. I do contemplate plenty, but I just like relaxing and watching the comings and goings of wildlife. I think I would be fine without all the fancy flowers if I could still have the trees and the wind and the birds…. Lovely, lovely irises. I too could become totally hooked but then again, they are already finished here so the garden would be emptly. I have just bought some more though, couldn’t resist. I think you should just sit and enjoy, that’s what a garden should be for. 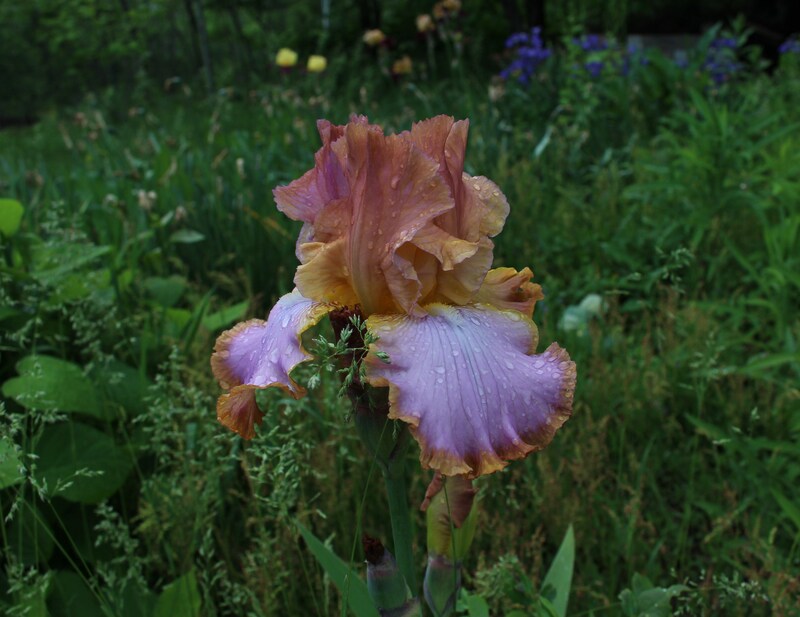 I think your first unknown iris might just be ‘Rustic Jewel’, look back at my posts about irises I featured it several times. What a coincidence! The two are very similar, I wonder if I have the same? Mine might be a little heavier on the ruffling and the beards might not be as orange, but they really look close. I’ll have to keep that name in mind, thanks! Hi Frank, I seem to have missed this one too! Good on you for relaxing in the shade and just enjoying your beautiful garden and irises. I should try that more often…your irises are beautiful. I think they really work best on their own but this means dedicating a whole border to them which is pretty boring for most of the year, but then if you have a large garden it doesn’t matter that much. 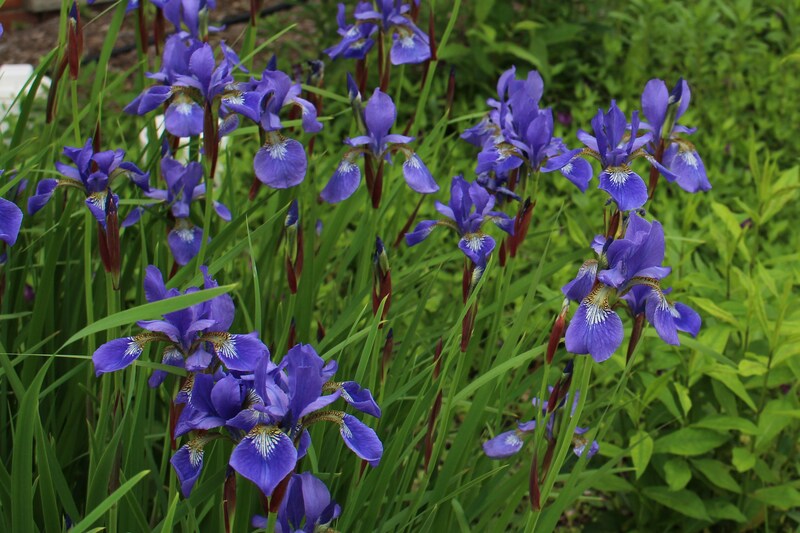 Years ago I saw a massed planting of Siberian Iris in the garden of Bryan’s Ground Garden (owned by the publishers of the quarterly magazine Hortus) and still dream about it, so I may do a similar thing on a smaller scale in my orchard. They’re just adorable! Mind you, my Iris foetidissima just flowered for the first time after being moved about so many times and I’m looking forward to the seeds. I’m considering a bed devoted to iris. I have a few which haven’t been happy enough to bloom for a few years and I think it’s about time they got the care they deserve! 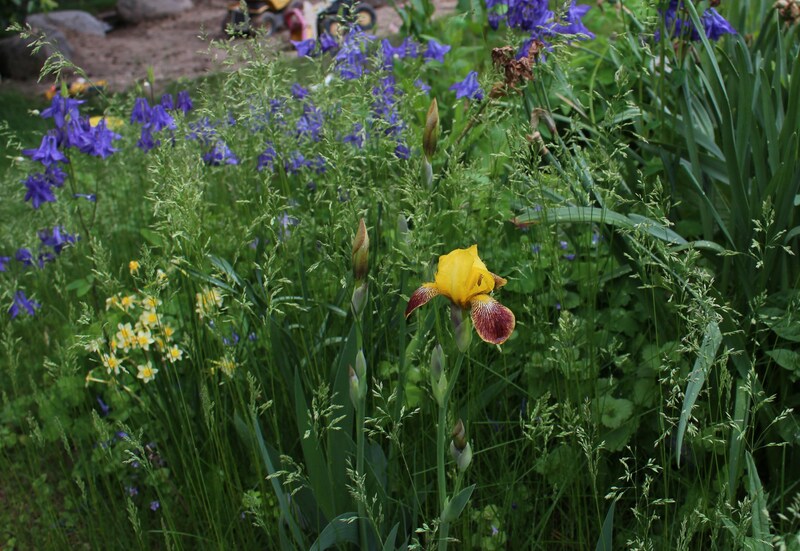 Previously they were in an iris bed, but my yard is always being rethought before plantings have enough time to come in to their own, so I really only saw one year of massed bloom. Who knows what the summer will bring, it’s almost iris transplanting season and the pull of the pool and vacations is very strong, so we’ll see who wins! You’re a wise man to devote time to sitting and enjoying the garden, instead of fretting and fussing over it. I concur with your admiration of ‘Darius’. 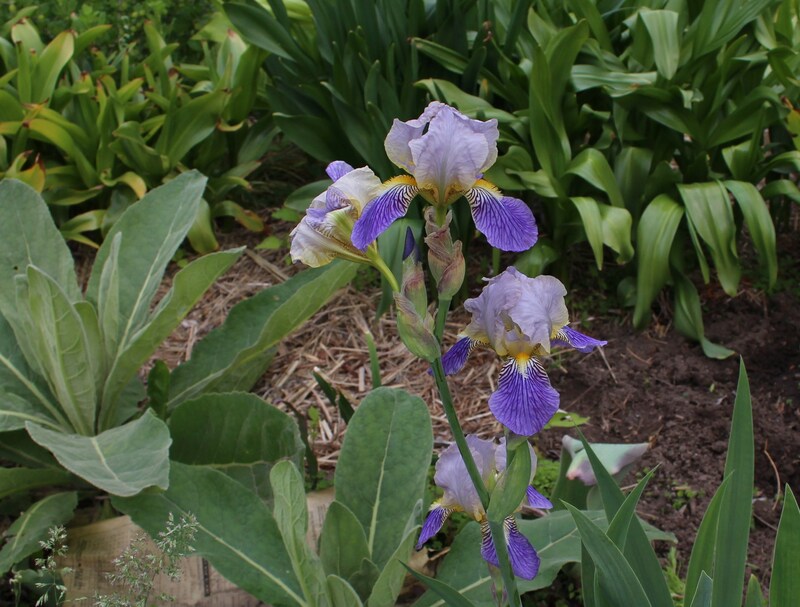 Irises are not a big enthusiasm of mine, but I can appreciate those in others’ gardens. If you do an iris bed I’s sure it would be quite beautiful. thanks. Iris need a little bit of attention, and they come and go depending on my attention span. I think ‘m going to try and focus long enough to get a bed going again.